During the winters, we sometimes make trips to Florida for recreation and entertainment. Often we'll take our enduro or motocross bikes along, and stay at the Holiday Inn in Brooksville, Florida, where we can get easy access to the wonderful Croom Motorcycle Area. That site is centrally located, and provides convenient access towards Orlando, Tampa, etc., for visiting the theme parks on days that you're not riding at Croom. Back in '92, when we were doing a lot of winter practice riding, we sketched out a map and guide to Croom, for our own use, and to give to friends at MRA. 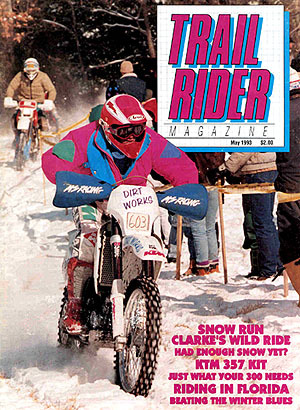 An extended version of that Croom guide that was published in Trail Rider Magazine in May of '93. That article is still a useful overview of Croom, although many details regarding prices, phone numbers, service businesses,etc., will have changed. Especially note that the phone number area code has changed from 904 to 352. Important note: The Holiday Inn that used to be just outside Croom, and referred to in the original article below, is now a Best Western motel. The motel is located just west of the I-75 and S.R.50/U.S.98 interchange. For more information about current Best Western's facilities, you can call them at 352-796-9481 or Toll Free 888-568-4060, and/or check the information at this page and this page. How Trail Riders can Avoid Cabin Fever! Fall is here and the season is winding down for many of us "north woods riders". You're thinking, "Gads, it's gonna be four or five months till we ride again. Skiing and snowmobiling can be fun for some, but there's just no substitute for dirt riding!" Last fall, while talking with Dave Bowman (owner of Small Displacement Motor Sports in Waterford, MI) my boyfriend Charlie and I were commiserating about all this. Dave said, "Hey, haven't you ever heard about Croom?" We said "What the heck is Croom?" We learned that the Croom Motorcycle Area is a large state park in central Florida set aside especially for dirt riding. It's near some major motocross tracks. Motocrossers from our area often use it for practice riding while down there for winter racing. That's how Dave first found out about it. The 2600 acre Croom trail riding/scrambles area is located between Gainesville and Tampa, right at the intersection of I-75 and Florida Route 50/US-98. There's a Holiday Inn right next it, and you can ride into Croom right from the motel parking lot! We thought this sounded great and resolved to check it out. Abstract thoughts turned to action. We joined the "snowbird pilgrimage" to the Sunshine State during the '91-'92 Christmas-New Year's holidays, hauling along an RM125, a KDX200 and an RMX250. Wow, Dave was right! Too much fun! We liked it so much, we squeezed in more vacation and went there again in late February! We found Croom to be a truly outstanding riding area, with terrain for all skill levels and types of riding. First off, there's a huge "training pit" near the motel that has some excellent motocross practice loops carved into it. You'll often see pro-level motocrossers practicing in this pit. You'll also see lots of amateur racers working to get their lap times down, and trail riders who like to go really fast. Then there are the four square miles of back country, perhaps the most interesting part of Croom for many trail riders. This rolling, forested area is criss-crossed by countless trails and a number of forest roads. Many trails carry you to old, abandoned phosphate quarries, now overgrown with trees, and carved by years of dirt riding into complex labyrinths full of 3-dimensional terrain. You'll probably find markers from enduro competitions out on these trails, and in the quarries you may find markers for trials sections going up, around and down through some wild terrain. Finally, there's an area near the campground set aside for inexperienced riders, where beginners can work out the basics of off-road motorcycling on easy, but very interesting, terrain. So, Croom has something for every riding style and level, including being a good place to introduce dirt riding to newcomers to the sport. Of course, another key thing Croom, especially for those with families that may not be too excited about "long dirt riding vacations", are all the other things you can do down there. Between days of hard riding at Croom, you can relax with your family and "play tourist" at nearby theme parks, such as Disney World, Sea World and Busch Gardens. Croom is about 170 miles south of the Florida/Georgia state line on I-75. Those coming down I-95 can jog over to I-75 by taking I-10 west from Jacksonville. Then take Exit 61 off of I-75 (just south of mile marker 303) and turn west, which takes you almost directly into the Holiday Inn driveway and Croom entrance road. Croom is administered by the Florida Division of Forestry in Brooksville. To get a brochure on the area, write or phone the Withlacoochee Forestry Center, 15019 Broad Street, Brooksville, Florida 34601. Phone: 904/ 754-6777. Key information about Croom is summarized in this Trail Rider article, including a copy of the brochure map that we've marked up to show the locations of phosphate pits, the perimeter fire-road, etc. The area is open for riding every day of the year, from sunrise to sunset. There is a $20 fee for an annual permit that runs from July to June. You can get the permit at the entrance gate on weekends, or otherwise at the Forestry Center or from the Resident Ranger. The fee is prorated by month of the year, and cost us only $12 per bike in Dec. '91. Croom rarely feels crowded, even though lots of folks ride there. You may find quite a few riders in the motocross training pit and near the main day-use area on weekends. But these areas aren't crowded during the week, and you'll seldom encounter other riders on the back country trails even on weekends. Much of Croom's terrain is soft and sandy, like our home terrain here in Michigan. Soft terrain tires (Dunlop 752's, for example) are your best overall choice here. In some areas, the surface sand is swept away, revealing an underlying hard-pack. This occurs on part of the campground road, in the main flats of the big training pit, in areas of the phosphate pits, and in the inexperienced rider area. In dry spells, some soft terrain trails can become very silty and powdery (at such times, try the less used trails for more speed and fun). During wet periods, while the soft terrain trails may be in great shape, you'll find sudden transitions onto slippery, "greasy" surfaces in the phosphate pits and on some of the hard terrain. Protective headgear is required in Croom. Spark arrestors aren't required at present, but the Rangers are considering changing the rules to require them. We recommend calling to get a current brochure and up to date information to be sure you have the right equipment. The basic layout of Croom is shown on the map. To enter the area, turn into the Holiday Inn driveway, then turn right to get to the main entrance gate. The entrance leads onto the road to the campground four miles into the area. The campground road is graded frequently and isn't full of whoops, so it's a fast way to get into various parts of Croom. Just past the entrance, you'll see trails to the big MX training pit just to the west of the campground road. This pit is about a half mile long, and has a fairly flat, level floor. Several motocross loops snake around its perimeter and down through its center. The motocross loops here offer excellent, fast practice riding. You'll also find practice jumps scattered around the pit. The flats on the bottom of the pit are hardpack, while the big berms on the perimeter slopes and on the flats are soft and powdery. The pit is open ground and visibility is good. Riders usually run the same direction on the MX loops, and there's passing room on the flats, so overall safety is pretty good, even on busy weekends. Parking for the training pit is on the left, about a half mile north of the entrance. If you trailer into Croom, this is also a good place to park for access to the southern end of the maze of trails that criss-cross the "back country". Note that the entire Croom Area is surrounded by a boundary fence. A perimeter fire-road follows this boundary fence all the way from south and west of the MX training pit, on up the west boundary to the campground. It begins again just northwest of the campground, and goes around the entire northern trail area, finally coming back down to the campground road on the east side of Croom. Once you're on back country trails, you can ride hard and take random turns all over the place, and when you feel tired just head to the perimeter fire-road to get back out to the campground road. You may not know exactly where you are, but neither can you really get lost. You can ride fast and hard for hours in these areas, and hardly ever use the same trail twice! This makes for fun riding, and makes the place seem even bigger than it really is. The main "day-use area" is located along the campground road, about 3-1/2 miles from the entrance. There are picnic tables, restrooms, water and more parking here. Some of the most interesting terrain in Croom, including the biggest phosphate pit system, is located near this site, so it's a good section to become familiar with. Just before reaching the day-use area parking, you'll see small pits and mounds off to your right (along the northern side of the road). These are a miniature sample of what you'll find in the larger, more complex pit system a little further along. A huge, multi-tiered phosphate pit extends for half a mile to the south of the day-use area. The rim of the pit is 60 feet or so above the bottom in places. You can enter the north end of the pit from the day-use area. A good way to get an overview of this pit is to ride the trails along its west rim. Here you'll find some easy (and some hard) ways down into the depths, but stay alert for many sheer dropoffs of 20 feet or more. It's a good idea to watch your speed around this phosphate pit until you've got it scoped out. Some well-used looking trails here are actually expert trials competition sections! But once you know your way around, you can enjoy ripping around on some fabulous rollercoaster-like trails that wind up, down and through this big pit system. The pits near the day-use area can get a bit crowded on weekends, because of their proximity to the day-use area and parking. If they're too crowded for your taste, and you want to play in 3-D terrain, go check out other, less well-known pits in the northern trail area (see below), which also offer lots of fun. As you go further west on the campground road from the day-use area you'll find the inexperienced rider area, just to the north of the road. This is a large flat field of hard terrain, with some small mounds, hills and chutes scattered around the edges. It's a perfect place for inexperienced dirt riders to learn the basics. Just inside the campground you'll even find a "raw beginner area", a small roped-off field of soft terrain for inexperienced riders only. It's in a location where parents can easily keep watch on youngsters, and is a perfect place for the tots on PW50's or similar mini-bikes to play. All along the campground road as it swings to the west from I-75, you can enter trails into the northern trail area. This big wooded section is about half the total area of Croom, and it contains some of the best trails. Here, soft terrain single-track winds through rolling country covered by relatively dense pine and hardwood forests. Several marginally maintained forest roads cut through the area, making it easy to get out to the perimeter fire-road or campground road. Interesting rides can sometimes be put together by following markers left after enduros held at Croom. However, trails used for enduros sometimes become heavily whooped if many riders later follow them. If the better-used marked trails are too soft or whooped for your liking, just keep branching off onto the many little-used trails, and you'll find the going much easier and much faster. The northern trail area contains two other phosphate pit systems. Near the northwest corner is the "Hollywood Hill" and "Lorain Gulch" pit system. This system is a bit tricky to find, but well worth it. Take the perimeter fire-road to 0.1 mile south of the turn at the northwest corner of Croom (see map), and then go east on trails about 0.6 mile. Hollywood Hill will be just off to the south, and Lorain Gulch just a bit further south. Hollywood Hill is a couple of sandy pits surrounded by large berms. It offers easy, fun, rollercoaster-like play opportunities over a saddle between the two pits. Lorain Gulch is a deeper pit with steep walls, and provides challenging, technical trials-like riding. These pits are a lot of fun, yet they usually aren't crowded since few riders seem to know about them (even though somebody has posted signs naming 'em). The other phosphate pit in the northern area is located on the eastern border of Croom (we call it the "Northeast Quarry"). To get there, turn onto the trail along the eastern fence-line from the point where the campground road turns west away from I-75. This trail goes 1/2 mile to a pit surrounded by a bunch of mounds and hills. There are play routes all over this area, ranging in difficulty from easy to nearly sheer vertical. Just north of this pit you'll find the eastern leg of the perimeter fire-road. There is a Holiday Inn on Florida Route 50 (which is also U.S. 98), just west of the intersection of 50 and I-75. Phone: 904/ 796-9481). This motel is a riders' favorite, since it's directly adjacent to the Croom entrance. It's a nice friendly place; pets are allowed and there's cable TV, a lighted tennis court and a swimming pool (unheated). Winter '92 rates were about $55/night, double occupancy. The Holiday Inn will usually have rooms available if you arrive at a reasonable hour, but it's best to call ahead for reservations. That way you can tell them you are riders, and reserve a room on the first floor by the rear parking lot. That section is the closest to Croom (and to the laundry and the bike washing area), so most riders ask for these rooms. There's a campground (with hot showers) in the Croom Area itself, four miles from the entrance via the campground road. Fees are only $8/day; $10/day with hookups. Call the Withlacoochee Forestry Center at 904/ 796-5650 for details. Many riders with RV's or Campers stay at the "Tall Pines RV Park", immediately east of I-75 on 50/98, just opposite Croom Area. Spring '92 fees were $17/day or $85/week. Reservations are encouraged (Phone: 904/ 799-8597). In addition, there are other motels at nearby I-75 exits, including a Day's Inn just east of I-75 at the Croom exit. The Mobil gas station across from the Holiday Inn, has gas up to premium grade (93 octane), and has some basic dirt bike supplies, including various popular two-stroke oils, filter oil, fork oil, duct tape, etc. You can ride out to the Motel entrance, and walk your bike across to this station. You can clean your riding gear by using a coin-op washer and dryer right at the motel, and there's a hose set up behind the motel utility building you can use to wash your bike. "MAX's", the restaurant at the Holiday Inn, offers excellent, "all you can eat" buffets at breakfast ($4.95), lunch ($5.95), and dinner ($8.95). Riders often take advantage of the buffets, even if they don't stay at the motel. There's a supermarket, a pharmacy, and several fast food restaurants just east of I-75 on 50/98. More stores and restaurants are located both in Brooksville, 11 miles to the west, and in Dade City, about 15 miles to the southeast. It's a one hour drive to the Disney World complex southwest of Orlando. Take S.R. 50 east to US-27, then south to US-192 and follow the signs. The renowned Walt Disney World includes the Magic Kingdom, EPCOT Center, and several smaller attractions. Busch Gardens theme park is 45 minutes south of Croom in northern Tampa. Take I-75 south to I-275, then continue south on I-275 and look for the signs. Busch Gardens is a combination of an amusement park with exciting rides, and open-landscape zoo. Many other tourist attractions such as Sea World, Cypress Gardens and Silver Springs are also nearby. Everyone in the family can enjoy many days of vacationing in this area. As winter approaches, instead of putting your bike away for the season, think about loading up the trailer, and being all set to head south when you get a chance. While nothing beats your local trails and riding events, Croom will be a good winter substitute. Not only is the riding great there, but so is the whole atmosphere. The many other riders you'll meet at Croom are friendly, because they're having fun too! We'll be heading down again this winter for at least a week or so. Maybe we'll see you there. One thing for sure: If you catch a serious case of cabin fever this winter, a dirt riding vacation at Croom will cure it! From the mid 1800's until early 1900's there was phosphate mining all over this part of Florida, dotting the landscape with old pits and quarries. Some small farming settlements developed in the area, but a flu epidemic swept through in 1915-16, wiping out many of these settlements. Nearby Oriole and Croom were very hard hit. The old cemetery in Croom, near the private property marked on the map, predates this tragedy by at least several decades, and may include some Civil War dead. Limited mining continued until the 1950's. The State purchased the land in 1956 from the Federal Government to add to the state forest system. Somewhere along the line, the State began allowing riders to use the big phosphate pit as a local scrambles area. In the mid 70's there was a lot of development in central Florida (Disney World opened in '72). Folks all over Florida sought to develop recreational opportunities for tourists and for people moving to Florida. One of the results was that two square miles of the Withlacoochee (Croom) State Forest, including the phosphate pits, were formally set aside for off-road riding. Two more square miles were added in the late 70's, creating the present-day 4 square mile riding area. Typical winter weather in central Florida can range from highs in the 50's to around 80, and lows in the 30's to 60's. While you won't encounter really hot or really cold weather, be prepared for these temperature ranges. Expect periods of showers and rain, which helps make the sandy terrain fast, but winter is generally dry in central Florida. All in all, it's about perfect weather for dirt riding. 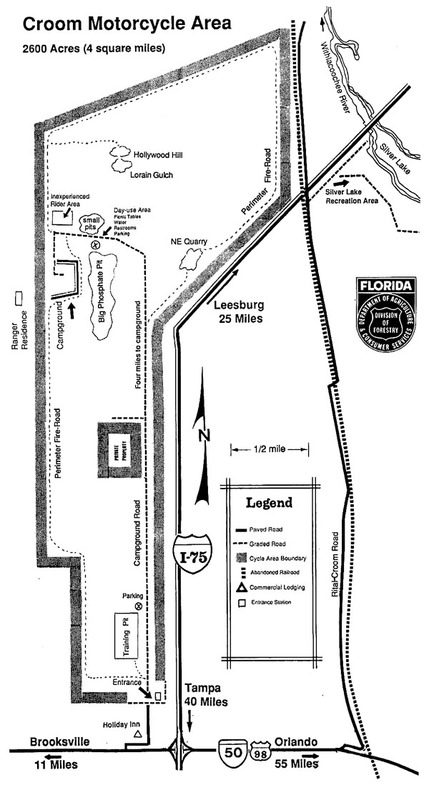 The Florida Motorsports Complex in Ocala, Florida (about one hour north of Croom) has two loop tracks: one hard pack and one sand track. To get there, take Exit 71 off I-75 and go east on 326 to C-25A. Turn south on C-25A and go 1/2 mile. Its on the left. The Complex runs a "Winter Practice Program" mainly aimed at the many racers in the area in winter. However, these tracks are open to all dirt riders, for a $10 per day fee. In '91-'92, the Complex was open 9:30 to 5:50, Tuesdays through Saturdays, from November 19 to March 14. For info, call the Complex at 904/ 732-6697. The motocross track at the Pasco County Fairgrounds in Dade City has open practices on Thursday nights, and races every Saturday night. The easiest way to get there is to go south on I-75 to the Florida 52 Exit, then go east on 52 for about 7 miles to the Fairground. There's a lot of motorcycle racing in central Florida winter, including the AMA Winter Olympics around Thanksgiving, the AMA Florida Winter Series from late December through January, and Daytona Speed Week in early March. Other national-level MX races are held in Florida in winter, including a couple of supercross races, and a stop on the National Motocross Series. MX races are also held every Saturday night at the Dade City Motorcycle Raceway at the Pasco County Fairgrounds, on route 52 just west of Dade City. Local, regional and national-level enduros and trials competitions are also held in central Florida during the winter. So there are lots of opportunities for interesting racing and race spectating. Cycle News is a good source of info on dates, times and places for these races. For more info on Croom's layout, take a look at the USGS Saint Catherine Fla., 7.5 Minute Quad, which covers most of the area. A small strip down the west side is covered by the Brooksville SE, Fla., Quad. These maps predate I-75 and Croom's development for riding, but they show the topography well, including locations of all the phosphate pits. In the event your bike breaks down and you need parts, there are a number of motorcycle shops in the central Florida area. A good, big shop for Suzuki's and Honda's is "Suzuki Honda Marine", 35 miles south of Croom in Tampa. It's located at 13521 N. Florida Avenue, just north of Fletcher Avenue (take Fletcher Avenue Exit off I-275, and turn west). Phones: 813/ 968-7888 and 800/ 237-3599. There are several nearby Kawasaki dealers, including "Citrus Cycle Center", 30 miles NW of Croom on US-41 in Inverness. Phone: 904/ 726-6676. "Mike's Yamaha", is located 11 miles west of Croom, on US-98 in Brooksville. Phone: 904/ 796-6116. Practically all brands of bikes are supported by the large grouping of shops in the Daytona Beach area about 2 hours to the east. Hopefully, YOU won't break down, but in case you do, Brooksville Regional Hospital is about 11 miles west of Croom, just south of where 50 and 98 split in Brooksville. Humana Hospital is about 20 miles away, on the south side of Dade City. Follow I-75 south to 52, then go east on 52 till just past the County Fairgrounds and watch for signs.